PACKED content with AN exclusive Brian Knight cover! 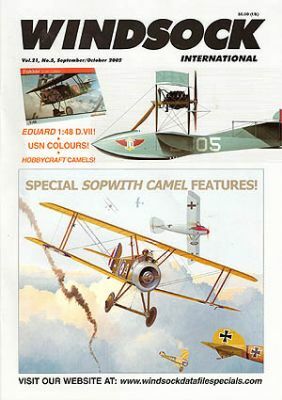 There's a special seven page Camel colours feature by Bruce Robertson with detailed narrative, many photos and three colour profiles together with British markings,fabric samples,paint match tables and more! Also in this issue: Colin Owers' USN Finishes Part 3 covers the markings of the Curtiss N.9 with three rear cover colour profiles of Curtiss F boats by Juanita Franzi, we take a nostalgic look at the Guillow's Bristol Bullet,there's an informed feature on WWI aviation movies available on DVD ; plus 10 great prize-winning 1:48 scale scratchbuilts by Dr. Raleigh Williams inspired by the aircraft featured in Those Magnificent Men in their Flying Machines;all this plus seven pages of kit reviews, all the regular columns and more!